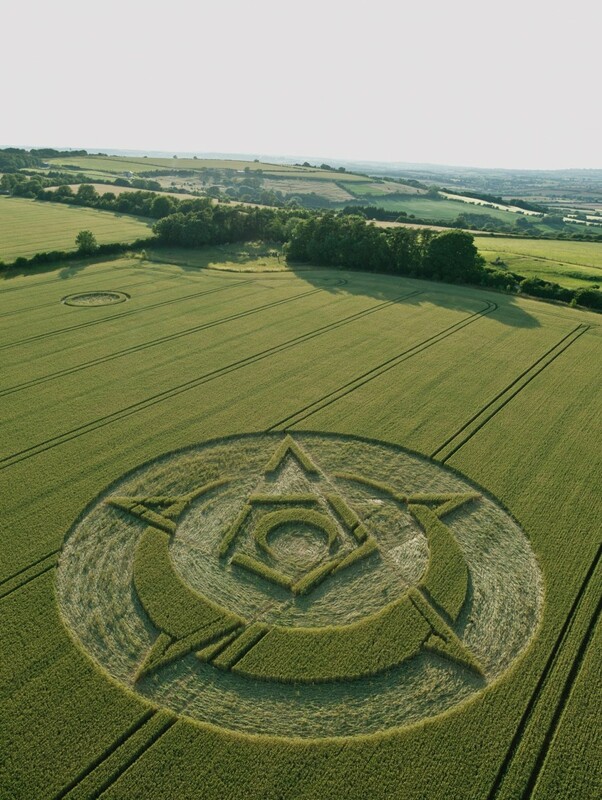 Somewhere about the 15th July 2015 two crop circles appeared in the wheat field between the King’s Men and the Whispering Knights. The larger circle is a complex design based on a five pointed star 150 ft (46 m) diameter. The smaller design is a simple double circular formation 50-60 ft (15 m) diameter. There are a number of theories to be found on the Internet as to the meaning of the designs: a 'golden ratio', 'golden triangle' or kite, night sky astronomy, the image of a 'bird' in the landscape or 'signs on the earth' that foretell the return of Christ. There are some that believe that the larger crop circle was announcing the conjunction of the sun and Venus on the 14th August 2015 as can be seen in the above graphic. For further explanations visit http://www.cropcircleconnector.com/2015/whispering/articles.html . According to Wikipedia the first known recording of a crop circle was in 1678 in a news pamphlet ‘strange news out of Hartfordshire’ (see above). The scientific consensus is that crop circles are constructed by humans as a prank but we all know who was really responsible!